New Delhi, 22 July 2017: Government has decided that the bank accounts that are not linked to Aadhaar will be frozen without the 12 digit bio-metric identity number after 31st December, 2017, who already have an account prior to 1.6.2017, shall submit their Aadhaar number by 31.12.2017, failing which the account shall cease to be operational till the time the Aadhaar number is submitted. Amendments have been effected to the Prevention of Money-laundering (Maintenance of Records) Rules, 2005 to provide that accountholders eligible to be enrolled for Aadhaar, who already have an account prior to 1.6.2017, shall submit their Aadhaar number by 31.12.2017, failing which the account shall cease to be operational till the time the Aadhaar number is submitted. They further provide that an individual eligible to be enrolled for an Aadhaar number shall, at the time of commencement of an account based relationship, submit the Aadhaar number and, where Aadhaar number has not been assigned, furnish proof of enrolment for Aadhaar. There is no requirement of furnishing Aadhaar cards along with Permanent Account Number (PAN) for transactions above Rs. 50,000. However, Income-tax Rules provide for quoting of PAN or furnishing of Form No. 60 in respect of transactions of specified nature in which the volume of the transaction exceeds Rs. 50,000 in a day. 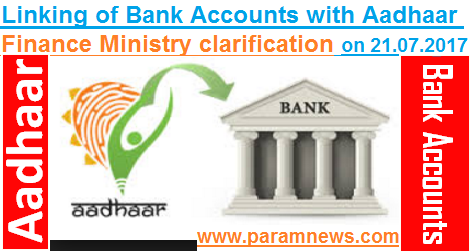 No account has been made in-operational due to non-submission of Aadhaar number as on date. This information was provided Finance Minister in a written reply to a question in Lok Sabha, Starred Question No. *99 (19th Position) for 21st July, 2017 by Shri Dhananjay Mahadik and Shri Ashok Shankarrao Chavan, M.P.s regarding “Linking of Bank Accounts with Aadhaar”. Government has decided that the bank accounts that are not linked to Aadhaar will be frozen without the 12 digit bio-metric identity number after 31st December, 2017, who already have an account prior to 1.6.2017, shall submit their Aadhaar number by 31.12.2017, failing which the account shall cease to be operational till the time the Aadhaar number is submitted.